The Awakening, from 2011, is better than most horror films I’ve seen. It’s also one of those films featuring the supernatural that doesn’t quite fit all that well into the surprisingly rigid definitions of the genre. Films like The Shining, The Sixth Sense, and others, are horror films by default, when in actuality, they rise above such rote classifications. The Awakening is not in the class of the two films cited above, but it has the same aspirations to break away from the bonds of genre. 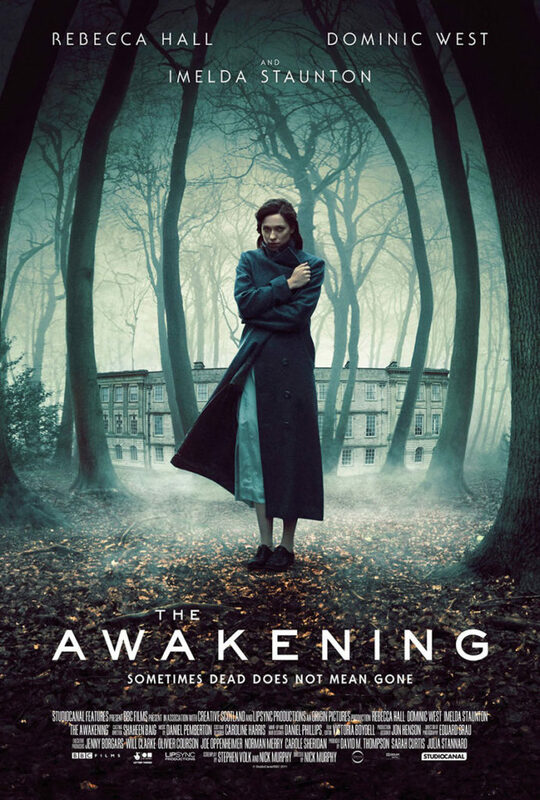 Directed by Nick Murphy, and written by Stephen Volk and Mr. Murphy, The Awakening follows Florence Cathcart (Rebecca Hall), a young woman in England a few years after the end of World War I. She’s Cambridge-educated and has fiercely-held beliefs. Among these are the equal status of women and the ridiculousness of belief in the supernatural, including belief in God. She’s the author of a widely-read book that purports to debunk the supernatural, and the viewer’s first experience with Florence is her doing just that. Soon after, she’s persuaded by a man named Robert Malory (Dominic West), a teacher at a boarding school in the north of England, to travel there and put to rest rumors of a ghostly child at the school. The story goes that once upon a time the school was a country house for a wealthy and prominent family (Country house is a bit of a misnomer for people here in the States. An English country house is a house in name only. We’re talking massive estates that at one time housed generations of a single, wealthy family and an army of servants.). A child was supposedly murdered at this house, and the crime covered up due to the family’s status. Now the murdered boy roams the halls of the school, scaring at least one student to death. Florence is militant in her nonbelief, and tackles the case head on. Although militant might not be strong enough a word. Florence is a damaged person, having grown up an orphan, and then losing the man she loved in the Great War. She uses her beliefs to deliberately set herself apart from the world, as the best means she can think of to attack its legitimacy while staying above the fray. As a character, she’s always close to coming unhinged, and never more so than when confronted with evidence that contradicts her truths. A ghost film, then, is the perfect place for a character like this. For the first half of the film, it’s ambiguous as to whether or not there’s a ghost at the school at all, or whether or not the pupils there are the victims of a nocturnal prankster. I won’t spoil that, as the mystery surrounding the ghost was the most successful aspect of the film. But it’s not a perfect film. It’s very well constructed. It inhabits its time and setting in a very convincing way, bathing in its atmosphere. But as well-made as the film is, the storytelling is spotty. A viewer is forced to delve back into the film in retrospect to work out Florence’s motivations, which are murky, at best, while the film is actually playing out on screen. Florence goes from zero to paranoid in a flash, and until I sat down later and thought about it, I was left wondering why? A film doesn’t have to lay out a character’s motivations on a silver platter, but The Awakening leaves far too much supposition to the audience. As with all films that wish to be taken seriously, there’s a twist at the end. A highly convoluted, unnecessary twist. The only reason it doesn’t detract from the rest of the film is because twisting is what films do now. That’s just the way things are. But still, the sheer narrative acrobatics necessary to get there left me more than a bit whiplashed. The Awakening is a good film. But its promise is much greater than its execution. Throughout, I kept wanting it to be the film it looked like it was supposed to be.